Obsessed by the solar religions of the east, the emperor Aurelian sets out to obtain every sacred object within his realm. But one – a mysterious rock said to channel the power of the sun god – lies beyond his reach. 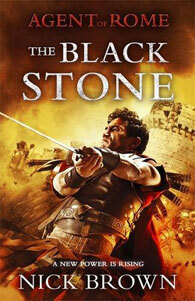 Warrior-priest Ilaha has captured the legendary stone and is using it to raise an army against Rome. For Imperial agent Cassius Corbulo and ex-gladiator bodyguard Indavara, stopping him constitutes their greatest challenge yet. Assisted by a squad of undercover soldiers and a Saracen chieftain, they trek south across the deserts of Arabia, encountering sandstorms, murderous money-lenders and a ruthless German mercenary. When they finally reach Ilaha’s mountain fortress, they face thousands of warriors who will give their lives to protect him … and the black stone.